As of August 2018, the ANSER Center transitioned to become the Center for Light Energy Activated Redox Processes (LEAP). The ANSER Center focuses on two basic research thrusts in its transformational work in the field of solar energy. Our greatest challenge is efficient fuel production at acceptable rates and driving forces. The ANSER Center is employing a hierarchical approach to understanding catalyst and photocatalyst function; thus, requiring a level of integration that cannot be achieved by any single research group. ANSER Center catalyst discovery is strongly hypothesis-driven, nicely complementing but not duplicating the approach of our collaborator, the DOE Joint Center for Artificial Photosynthesis (JCAP) Energy Innovation Hub. performance, including catalyst kinetics and overpotentials. 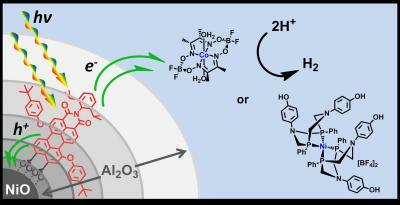 Figure 1: Photocatalytic proton reduction by molecular catalysts in solution via electron transfer from a purpose-synthesized organic chromophore bound to a semiconductor surface. ANSER Center research tests theory-driven ideas to understand at a fundamental level how photovoltaic cell performance is affected by nanoscale/mesoscale architectural-electronic structure relationships in soft-matter and in hybrid soft-matter/hard-matter solar cells, photon capture, exciton creation and decay, exciton dissociation/quenching, and charge transport, electrode microstructure, doping, and surface chemistry. Photovoltaic cells fabricated from relatively simple, non-toxic, earth-abundant, mechanically flexible, and low-cost materials offer the prospect of efficient large-scale solar electricity production. Efficiencies have advanced dramatically in the past five years, driven by an ever-increasing, but by no means complete, understanding of the relevant chemistry, materials science, physics, and performance limits. A closely integrated, highly productive interplay of synthesis, characterization at multiple time and length scales, and theoretical analysis and prediction, led to a number of ANSER Center “firsts” in materials design, mechanistic understanding, and performance metrics. ANSER Center research is testing ideas driven by theory to understand at a fundamental level how photovoltaic cell performance is affected by nanoscale/mesoscale architectural-electronic structure relationships in soft-matter and in hybrid soft-matter/hard-matter solar cells, photon capture, exciton creation and decay, exciton dissociation/quenching, and charge transport, electrode microstructure, doping, and surface chemistry. Understanding these phenomena feeds back directly to developing light capture and charge delivery strategies to power solar fuels catalysts as well. Figure 2: (a) Photo of an encapsulated low-temperature vapor-assisted solution processed device and a cross-sectional scanning electron micrograph of a functional device and (b) current-voltage characteristics of lead-free perovskite devices. 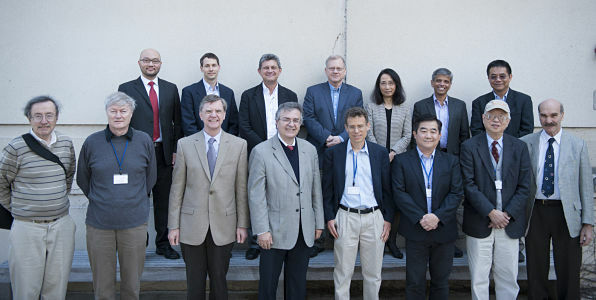 ANSER Center members and speakers at the 2015 ANSER Symposium.